I made it through October with no heat! This past weekend was very chilly (for us at least! ); it dropped down into the low 40s. It was the first time we’ve seen temperatures that low this fall and the first time I even considered moving the thermostat from AC to heat. The temperature upstairs, where my room is, was 63 when I woke up and hovered around 65 all day on Saturday. I was so tempted to turn on the heat, but I bundled up and survived. So far I haven’t turned on the heat at all this month, but it’s been fairly warm. The temperature has been dropping all day and we are expected to have a light frost Friday night/Saturday morning. I’m thinking that I’m going to be turning the heat on this weekend! 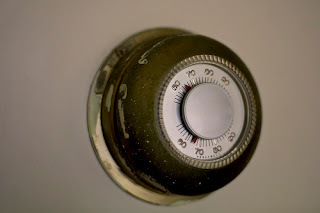 I plan to flip the switch from AC to heat, but set it to only run if it gets below 64. I figure if I can survive 63, then 64 should be plenty warm. As of today, the no-heat challenge has been very easy. Now it’s going to be all about making it to the weekend before turning on the heat and then adjusting to a winter of cooler temperatures and many layers. Are you participating in the no-heat challenge? How are you doing? We made it but had to buy an electric blanket. I feel like a dirty dirty cheater because of the weather here, but I made it easy. We are still running the air where I'm at. As a sort of…compromise(?) I'm going to see how long into "winter" I can go without turning on the heater. Previous post: Academic Library = Student Center?